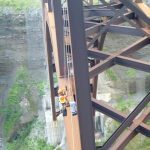 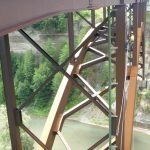 Vertical Access was retained by Prudent Engineering to assist in the biennial inspection of two steel arch bridges spanning Cattaraugus Creek near Springville, NY. 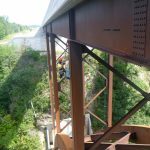 Vertical Access technicians developed and installed rigging and rope systems for Prudent engineers to gain hands-on access to inspect components of the steel structures outside the reach of the under-bridge inspection unit (UBIU). 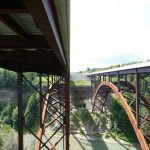 The twin steel arch bridges supporting concrete decks were constructed between 2007 and 2010. 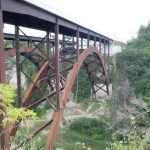 The bridges carry US Route 219 over Cattaraugus Creek connecting Cattaraugus and Erie Counties.